Biased wheel is the daydream of each professional and amateur gambler in the world. 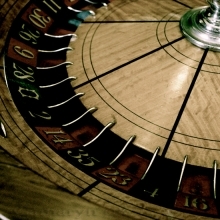 The dream comes true when there is a biased roulette wheel or table found. It means that the mechanical flaw influences the results of the game. When it comes to the roulette tables production, all the manufacturers try to be as accurate as possible. The entire game is built around the wheel. It must be perfectly balanced, all the pockets, where the ball lands must be equal in size and material they are made of. There are some woods that can be a good bouncing platform for the ball and those, from which the ball would hardly jump off - all these cause intentional biases in the wheel. All the frets (the metal separators) also must be properly fixed. The pockets must be also done correctly: if one of them gradually enlarges, because many times the ball landed there, it increases chances of the ball landing in the very pocket. That can make the wheel biased! If the same result comes up every twenty or thirty spins, the wheel might be biased. Of course if the ball is not tripped. Actually, it is not quite a real thing for nowadays because the casinos pay huge money for keeping all the equipment in the best shape to avoid the biased wheels. If you become so lucky to reveal the biased wheel, you should take advantage of it, because we know that there is no wheel memory at the roulette game and if the "lucky number" comes up so often, it would be very foolish not to use it. But in order to do so, you need to spend some time just watching and writing down the results. It is so time consuming. There is a very slight chance that you would be able to find such a wheel and then to use it for a long time. Maybe 13 black will become your lucky number? The casinos do not like very lucky visitors. If they do not find out that you cheat, they can simply recommend you to leave. And you cannot do anything against that, just obey. Don't expect luck and success, go find them first and be happy!